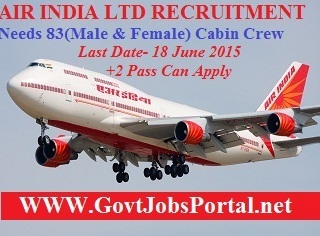 Airline Allied Services Limited, a wholly owned subsidiary of Air India Ltd invites application from Unmarried Indian Candidates for the post of Cabin Crew in Northern, Western, Eastern and Southern Regions on Fixed Term Engagement. Educational Qualification : 10+2 from a recognized Board/University. Candidates who have 3 years Degree/Diploma in Hotel Management and Catering Technology from a Government recognized Institute will be given preference. Age Criteria : 18 to 27 years. Selection Mode : Selection will be based on performance in GD, PAT & Written Test. Mode of Apply : Candidates can apply online through their Official website only. You can apply directly through the given link below.